TMG The Mortgage Group is proud to announce a strategic affiliation with NU Stream Realty Inc and NU Stream Mortgage Inc located in B.C. NU Stream was searching for a partner with similar values to help facilitate its incredible growth, while at the same time servicing their clients with the best mortgage products in the market. “TMG has earned a stellar reputation in the industry because our staff, systems and resources are placed against the filter of adding value to our broker partners. We’re confident TMG will truly complement NU Stream’s business and make this partnership a win-win,” Pultr added. 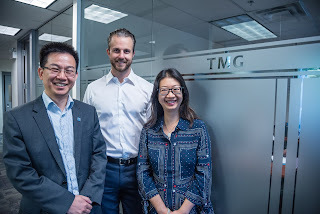 TMG The Mortgage Group is an award-winning mortgage brokerage and the largest independent brokerage in Canada with more than 800 agents and brokers across the country. NU Stream Realty Inc. is an innovative real estate brokerage company using a team-based model that has proven to be highly efficient, professional, and comprehensive. NU Stream Realty Inc. is developing operations in both the Vancouver and Toronto Chinese markets simultaneously, establishing a platform to serve customers across Canada.